Due to the encouragement of an undergraduate vocal professor, Raul Valdez ’19 traveled from Texas to California to audition for the vocal performance graduate program at the University of Redlands School of Music. Unexpectedly, he found his new home. Valdez says that studying voice and opera with U of R Professor Marco Schindelmann has been a highlight of his experience as a vocal performance student. 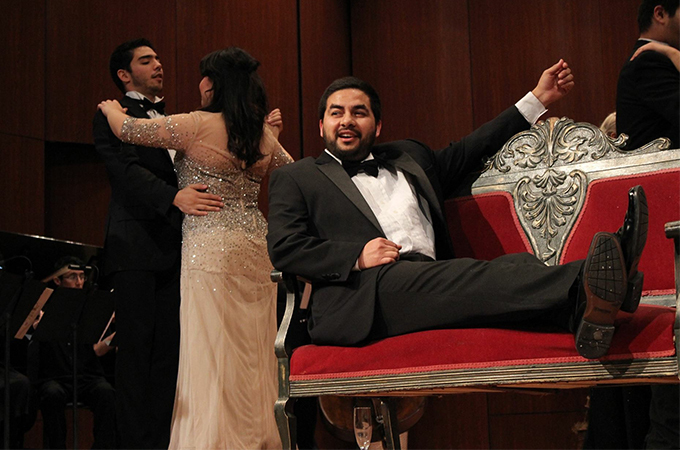 Schindelmann has helped him conquer both homesickness and opera workshops—feats that enabled Valdez to be selected to perform in the 2018 President’s Honor Recital. Valdez notes that opportunities to work with live orchestras while studying at the University of Redlands have given him a unique experience. “It was amazing to work with The Who last September, and I’m excited to perform in Dido & Aeneas and work with the King Singers in April. I’ve never performed a lead role in an opera with full orchestra, so the opportunity to do that is exciting,” he says. The sense of community in the School of Music makes it all worthwhile, according to Valdez. “It’s about building each other up and seeing what we can do together,” he says. The President’s Honor Recital will begin at 4 p.m. on Sunday, March 4, in the Memorial Chapel on the main Redlands campus. Admission is free and open to the public.